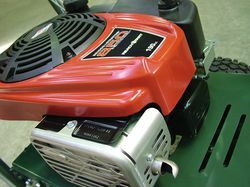 The XF560 Deutscher Mower is the smallest of the mowers we produce. It’s designed to handle large grassed areas which are too big for a standard domestic mower. 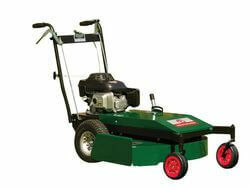 With caster wheels on the front and large rear wheels, this mower is easy to handle and operate for its size. 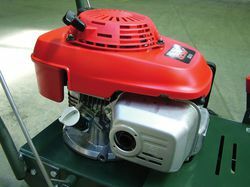 A transaxle housing 2 forward speeds and a differential is operated when a hand clutch is raised on the handlebar. 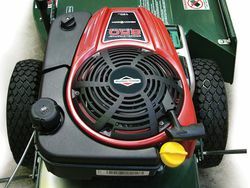 This mower is available with either a B&S 850 Professional series engine or a GCV190 Honda engine. Both engines are 190cc and meet emission standards. 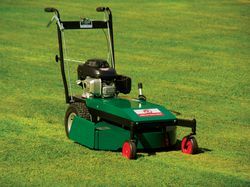 This mower is built using quality materials to ensure the product you buy is reliable and long lasting. This mower is proudly made in Australia. Throttle mounted on control panel |Gear selector lever on control panel | Drive clutch – on RH side of handle |	Blade height control mounted on LH side of mower Blade engage lever – foot pedal on LH side of mower.